Ever since I started working as UI/UX Developer at Kommdirekt GmbH I began logging every cents that I got and spent. I used to do that a long time ago until I realized how steady my income and expense were. Well, student-live back then. Everything was kinda predictable. Now that I began a new life, I know I will spend money like crazy —cough, holiday every 4 weeks, cough― and that’s why I need to keep tracking my expenses and incomes. I found this app named Fentury while reading a blogpost discussing Finance management apps. Fentury have web, iOS and Android app. The focus on this blogpost is the flaw in the Android app, since I don’t own iPhone. Well, I have an iPad, but that device is only for watching Stranger Things. Drop-down with a search function is the future guys… not. In the Android app you’re basically expected to know every available category in the app. 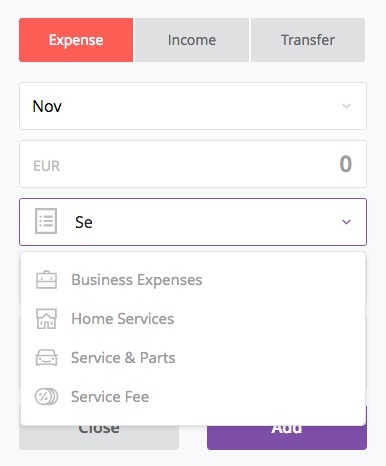 Unlike the web app which allows you to search the category, the mobile app forces you to click each category to find the category that you’re looking for. I ended up putting half of my expenses under Miscellaneous and at the end of the month I just don’t bother anymore to check where my money went. I was typing the description of my expense and I was looking for the submit button. Well, there are no single button at all to confirm my input. So I taped the back button and viola it’s saved. As a user and an UX Developer, I expect back button to go back to previous screen or to cancel anything that you do without saving it. Maybe I need to update the definition of back button in my brain? EDIT: Well that Enter button on the keyboard is the ‘submit’ button too. I can’t say much about that though. It makes me curious whether the iPhone app also has this flaw. I might check it out later. So this is the post for today and the last couple of week I’ve been absent. See you in the next post and make sure to leave a comment below, or just follow me on Twitter and Instagram. Got special inquiry regarding UI and UX? Send me an E-Mail. I’m looking forward to work together with you.